You know what makes a good personal friend. But what makes a good work friend? After all, you’re not trusting them with the darkest secrets of your soul, or needing their help to get through a bad breakup. Think about it, though. Maybe the qualities of a true friend are basically the same no matter where you find them. A good work friend supports you when you’re having difficulties, whether it’s with an impossible deadline or an unfriendly co-worker. She doesn’t talk about you behind your back, or if she does, it’s only the good things. A real work friend takes his full share of the workload. And no more than his fair share of the credit for a project you worked on together. He shares his coffee creamer when you run out. And the tab when you go out for lunch together. This must-have work friend shows you the ropes. Tricks for getting your tasks done faster and better. Personalities of the people you work with, and how to deal with (or avoid) them. And where there’s a secret stash of sticky notes. Tells It to You Straight. Yeah, this one isn’t always fun. But sometimes, being honest about your mistakes or weaknesses is the biggest favor a work friend can do you. As long as it’s said in the spirit of constructive criticism, she enables you to do better, not just feel worse. Of course, as the saying goes, you have to be a friend to get a friend. So try to have the same qualities yourself that you look for in others. These are our top 4. 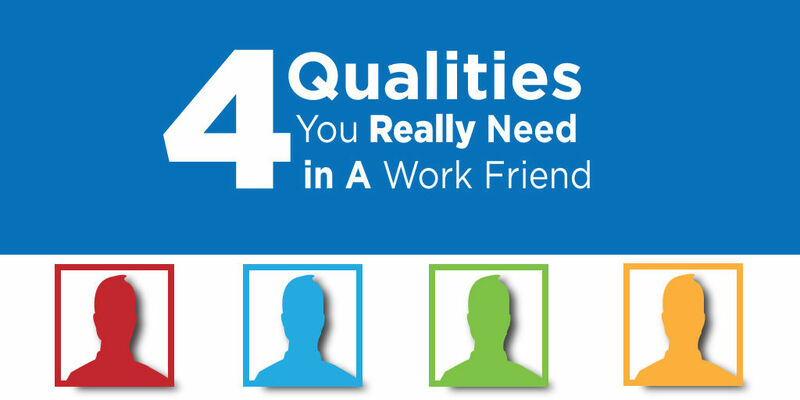 What are your most important work friend qualities? Tell us in the comments.